Offsite Climbing and Abseiling Activities can be catered for on local crags and quarries. 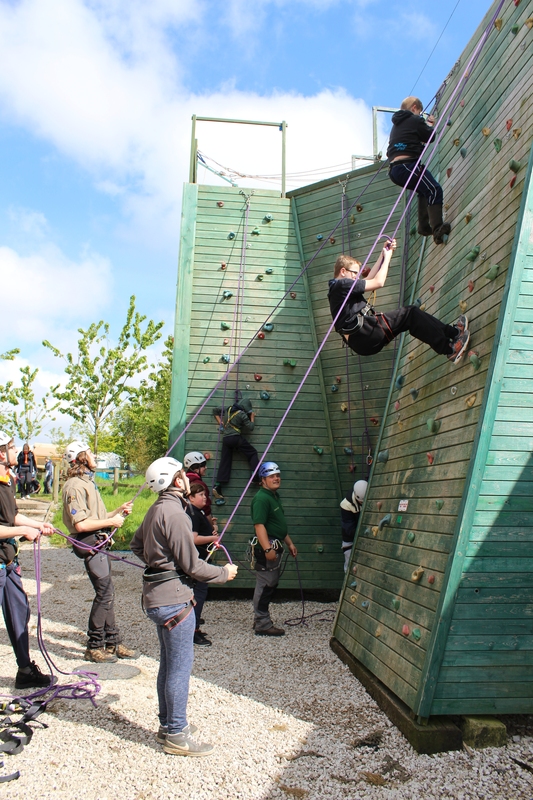 However, Bibbys Farm Scout Campsite and Activity Centre do not operate a hire or loan facility for Climbing and Abseiling equipment to be used offsite. All instructors, whether Centre Personnel or Visitors using the Centre’s Climbing Walls shall follow the Centre’s guidelines. Supervisory arrangements will vary depending on the ability and needs of the group, but should not exceed 1:6 (unless specifically authorised via NGB SPA). a) Read and signed the Climbing and Abseiling Requisition Form. c) Been made aware of the location of First Aid Equipment / Emergency telephone etc. NOTE: The Qualifications of the Leader in Charge of the Activity must be checked at the time of booking. When dressing to climb avoid baggy shirts and sleeves, chest pockets with buttons should also be avoided. The carrying of items in pockets should be avoided. Long hair could become a hazard or obscure vision, either tie back or wear appropriate head gear. A strong pair of shoes or trainers must be worn, wellington boots or crocs are not suitable. A First Aid Kit must be available at all times and its location should be known by all participants. Activity instructors should ensure that all group members use the wall in a controlled manner. Food shall not be permitted in the climbing area. Climbing ropes and other equipment must be inspected prior to use. Damaged items must be immediately removed from service and tagged with details of the fault. A safety briefing shall be provided by the instructor to all participants. Helmets must be worn by all participants under 16 years of age. Instructors must check for correct fitting and that any loose straps or hair are safely tucked in. Spectators and non participants shall not be in close proximity to the Walls to reduce the risk from falling objects . Suitable climbing harnesses must be used by all participants. Instructors to check for correct fitting and buckling before use. Belayers must wear a harness and must be supervised by an authorized activity instructor who should be able to take control of the rope if necessary. Abseil ropes must be attached to independent anchor(s) by a method that can be released under tension. When abseiling, participants must be secured by a safety rope. The safety rope must be tied off whilst connecting the abseiler to the abseil rope. Abseiling must be done in a controlled manner. Any abseiler who accelerates must be halted immediately by the safety rope. Descenders will be linked to harnesses using a triple action karabiner. Horseplay of any kind should be discouraged throughout the session. It is the responsibility of the activity instructor to ensure that all equipment is stored correctly at the end of the session.